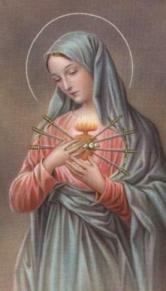 An apostolate established on September 15, 2004, the Feast of Our Lady of Sorrows, for the purpose of helping release the Holy Souls from Purgatory. 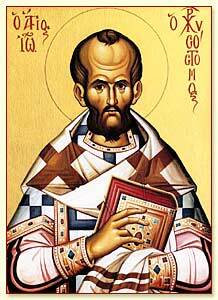 St. John Chrysostom - “Let us help and commemorate them. If Job’s sons were purified by their father’s sacrifice (Job 1:5), why would we doubt that our offerings for the dead bring them some consolation? Let us not hesitate to help those who have died and to offer our prayers for them” (Homilies on 1 Corinthians 41:5 [A.D. 392]). “Weep for those who die in their wealth and who with all their wealth prepared no consolation for there own souls, who had the power to wash away their sins and did not will to do it. Let us weep for them, let us assist them in the extent of our ability, let us think of some assistance for them, small as it may be, yet let us somehow assist them. But how, and in what way? By praying for them and by entreating others to pray for them, by constantly giving alms to the poor on their behalf. Not in vain was it decreed by the apostles that in the awesome mysteries remembrance should be made of the departed. They knew that here there was much gain for them, much benefit, when the entire people stands with hands uplifted, a priestly assembly, and that awesome sacrificial Victim is laid out, how, when we are calling upon God, should we not succeed in their defense? But this is done for those who have departed in the faith, while even the catechumens are not reckoned as worthy of this consolation, but are deprived of every means of assistance except one. And what is that? We may give alms to the poor on their behalf” (Homilies on Philippians 3:9-10 [A.D. 402]}. St. John Chrysostom also recommends to every Christian family that they have a box at some convenient place in their home and that they put into it pennies, which will be used to have masses said for the Poor Souls. 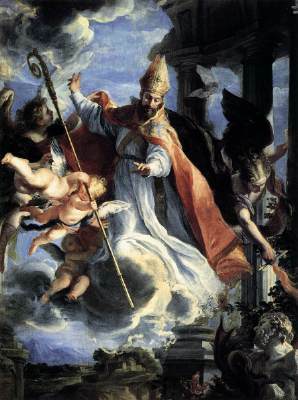 St. Augustine - “But by the prayers of the Holy Church, and by the salvific sacrifice, and by the alms which are given for their spirits, there is no doubt that the dead are aided, that the Lord might deal more mercifully with them than their sins would deserve. The whole Church observes this practice which was handed down by the Fathers: that it prays for those who have died in the communion of the Body and Blood of Christ, when they are commemorated in their own place in the sacrifice itself; and the sacrifice is offered also in memory of them, on their behalf. If, then, works of mercy are celebrated for the sake of those who are being remembered, who would hesitate to recommend them, on whose behalf prayers to God are not offered in vain? It is not at all to be doubted that such prayers are of profit to the dead; but for such of them as lived before their death in a way that makes it possible for these things to be useful to them after death”. “Temporal punishments are suffered by some in this life only, by some after death, by some both here and hereafter, but all of them before that last and strictest judgment. But not all who suffer temporal punishments after death will come to eternal punishments, which are to follow after that judgment” (The City of God 21:13 [A.D. 419]}. St. John Vianney - "We must say many prayers for the souls of the faithful departed, for one must be so pure to enter heaven." Nicholas Gurrutti was born in the village of Sant’ Angelo in Pontano, Italy, in 1245. His parents, middle aged and childless, made a pilgrimage to the shrine of St. Nicholas of Bari, their special patron. Shortly thereafter a son was born to them whom they named Nicholas out of gratitude. At an early age Nicholas was greatly moved by the preaching of an Augustinian, Fr. Reginaldo, prior of the monastery in Sant’ Angelo, and requested admission to the community. He was accepted and made his novitiate in 1261. Nicholas directed all his efforts to being a good religious and priest. Those who knew him saw him as a simple religious, full of charity for his brothers and for God’s people. He devoted himself to prayer and works of penance with such intensity that at times it was necessary for his superiors to impose limitations on him. At one point he had so weakened his body through fasting that he was encouraged to eat a piece of bread signed with the cross and soaked in water to regain his strength. He was ordained a priest in 1271 and lived in several monasteries of the Order in the ministry of preaching. In 1275 he was sent to Tolentino and remained there for the rest of his life. Nicholas worked to fight the decline of morality and religion which came with the development of city life in the late 13th century. He ministered to the sick and poor and sought out those who became estranged from the Church. 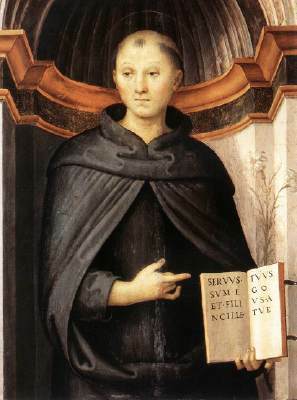 His reputation as a saintly man and a worker of miracles led many people to the monastery of Tolentino. Many of the cures obtained through his prayers were received while he himself was ill.
Nicholas died in Tolentino on September 10, 1305. He was declared a saint and “Protector of the Universal Church” in 1446. In 1884 Nicholas was proclaimed by Pope Leo XIII “Patron of the Souls in Purgatory”. Nicholas is buried in the basilica in Tolentino which bears his name. His feast is celebrated on September 10th. St Lidwina saw in Purgatory a soul that suffered also for mortal sins not sufficiently expiated on earth. The incident is thus related in the Life of the saint. A man who had been for a long time a slave of the demon of impurity, finally had the happiness of being converted. He confessed his sins with great contrition, but, prevented by death, he had not time to atone by just penance for his numerous sins. Lidwina, who knew him well, prayed much for him. Twelve years after his death she continued to pray, when, in one of herecstasies, being taken into Purgatory by her angel-guardian, she heard a mournful voice issuing from a deep pit. "It is the soul of that man" said the angel, "for whom you have prayed with much fervour and constancy." She was astonished to see him so deep in Purgatory twelve years after his death. The angel, seeing her so greatly affected, asked if she was willing to suffer something for his deliverance. "With all my heart," replied the charitable maiden. From that moment she suffered new pains and frightful torments, which appeared to surpass the strength of human endurance. Nevertheless, she bore them with courage, sustained by a charity stronger than death,until it pleased God to send her relief. She then breathed as one restored to a new life, and, at the same time, she saw that soul for which she had suffered so much come forth from the abyss as white as snow and take its flight to Heaven. Taken from: Purgatory Explained Authored by: Father F.X. Shouppe, S.J. Let us add here a consoling fact, which we find in the life of St. Lutgarda. A celebrated preacher, named John de Lierre, was a man of great piety and well known to our saint. He had made a contract with her, by which they mutually promised that the one who should die first, with the permission of God, should appear to the other. John was the first to depart this life. Having undertaken a journey to Rome for the arrangement of certain affairs in the interest of the Religious, he met his death among the Alps. Faithful to his promise, he appeared to Lutgarda in the celebrated cloister of Aywieres. On seeing him, the saint had not the slightest idea that he was dead, and invited him, according to the Rule, to enter the parlor that she might converse with him. "I am no more of this world," he replied, "and I am come here only in fulfillment of my promise." At these words Lutgarda fell on her knees and remained for some time quite confounded. Then, raising her eyes to her blessed friend, "Why," said she, "are you clothed in such splendor? What does this triple robe signify with which I see you adorned?" "The white garment," he replied, "signifies virginal purity, which I have always preserved; the red tunic implies the labors and sufferings which have prematurely exhausted my strength; and the blue mantle, which covers all, denotes the perfection of the spiritual life." Having said these words, he suddenly left Lutgarda, who remained divided between regret for having lost so good a Father, and the joy she experienced on account of his happiness. From: Purgatory Explained By: Father F.X. Schouppe, S.J. 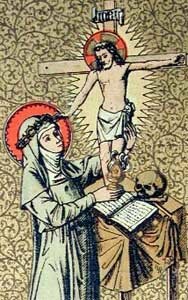 In the Life of St. Lutgarda, written by her contemporary, Thomas de Cantempré, mention is made of a Religious who was otherwise fervent, but who for an excess of zeal was condemned to forty years of Purgatory. This was an Abbot of the Cistercian Order, named Simon, who held St. Lutgarda in great veneration. The saint, on her part, willingly followed his advice, and in consequence a sort of spiritual friendship formed between them. But the Abbot was not as mild toward his subordinates as he was towards the saint. Severe with himself, he was also severe in his administration, and carried his exactions in matters of discipline even to harshness, forgetting the lesson of the Divine Master, who teaches us to be meek and humble of heart. him freed from his pains." Since I am mentioning St. Lutgarda, ought I to speak of the celebrated apparition of Pope Innocent. I acknowledge the perusal of this incident shocked me, and I would fain pass it over in silence. I was reluctant to think that a Pope, and such a Pope, had been condemned to so long and terrible a Purgatory. We know that Innocent, who presided at the celebrated Council of Latern in 1215, was one of the greatest Pontiffs who ever filled the chair of St. Peter. His piety and zeal led him to accomplish great things for the Church of God and holy discipline. How, then, admit that such a man was judged with so great severity at the Supreme Tribunal? How reconcile this revelation of St. Lutgarda with Divine Mercy? I wished, therefore, to treat it as an illusion, and sought for reasons in support of this idea. But I found, on the contrary, that the reality of this apparition is admitted by the gravest authors, and that it is not rejected by any single one. Moreover, the biographer, Thomas de Cantimpré, is very explicit, and at the same time very reserved. "Remark, reader," he writes at the end of his narrative, "that it was from the mouth of the pious Lutgarda herself that I heard of the faults revealed by the defunct, and which I omit here through respect for so great a Pope." receives according to his works? The reality of this apparition cannot, then, be reasonably called into question. I see no reason for omitting it, since God does not reveal mysteries of this nature for any other purpose than that they should be made known for the edification of His Church. Pope Innocent died July 16, 1216. The same day he appeared to St. Lutgarda in her monastery at Aywieres, in Brabant. Surprised to see a spectre enveloped in flames, she asked who he was and what he wanted. "I am Pope Innocent," he replied. "Is it possible that you, our common Father, should be in such a state?" "It is but too true. I am expiating three faults which might have caused my eternal perdition. Thanks to the Blessed Virgin Mary, I have obtained pardon for them, but I have to make atonement. Alas! It is terrible; and it will last for centuries if you do not come to my assistance. In the name of Mary, who has obtained for me the favor of appealing to you, help me." With these words he disappeared. Lutgarda announced the Pope's death to her sisters, and together they betook themselves to prayer and penitential works in behalf of the august and venerated Pontiff, whose demise was communicated to them some weeks later from another source. Taken from: Purgatory Explained Authored by: Father F.X. Schouppe, S.J. St. Bernard highly praises St. Malachy for his devotion towards the souls in Purgatory. When he was a deacon, he loved to assist at the funerals of the poor, accompanying their remains to the cemetery with as much zeal as he ordinarily saw those unfortunate creatures neglected after their death. He had a sister, filled with the spirit of the world who thought her brother degraded himself and his family by associating with the poor. She understood neither Christian Charity nor the excellence of the Holy Sacrifice of the Mass. He told his sister that she had forgotten the teaching of Jesus and that she would one day repent of her thoughtless words. His sister died while still young and went to render an account to the Sovereign Judge of the worldly life she had led. St. Malachy offered the Holy Sacrifice for her and prayed much for her. In time, having many others to pray for, he neglected his poor sister. She appeared to her brother during his sleep. He saw her standing in the middle of the area before the church, sad, clad in mourning, and entreating his compassion, complaining that for the last thirty days he had neglected her. He awoke suddenly and remembered in reality it was thirty days since he had celebrated Mass for his sister. On the following day he began anew to offer the Holy Sacrifice for her. Then she appeared to him at the door of the church, kneeling upon the threshold, and lamenting that she was not allowed to enter. He continued his suffrages. Some days later he saw her enter the church and advance as far as the middle of the aisle, without being able to approach the altar. He saw it was necessary to persevere, so he continued to offer the Holy Sacrifice for the repose of her soul. Finally, after a few days he saw her near the altar, clad in magnificent attire, radiant with joy, and free from suffering. St. Peter Claver, of the Company of Jesus, Apostle of the Negroes of Carthagena, knew of the Purgatory of two souls, who had led poor and humble lives upon earth; their sufferings were reduced to a few hours. We find the following account of it in the Life of this great servant of God. He had persuaded a virtuous negress, named Angela, to take into her house another negress named Ursula, who had lost the use of her limbs and was covered with sores. One day when he went to visit them, as he did from time to time, to hear their confessions and to carry them some little provisions, the charitable host told him with grief that Ursula was at the point of death. "No, no," replied the Father, consoling her, "she has yet four days to live, and she will not die until Saturday." When Saturday came, he said Mass for her intention, and went out to prepare her for death. After spending sometime in prayer, he said to the hostess with an air of confidence, "Be consoled, God loves Ursula; she will die to-day, but she will be only three hours in Purgatory. Let her remember me when she shall be with God, that she may pray for me, and for the one who until now had been a mother to her." She died at noon, and the fulfilment of one part of the prophecy gave great reason for belief in the accomplishment of the other. Another day, having gone to hear the confession of a poor sick person whom he was accustomed to visit, he learned that she was dead. The parents were extremely afflicted, and he himself, who had not believed her to be so near her end, was inconsolable at the thought of not having been able to assist her in her last moments. He knelt down to pray by the corpse, then suddenly rising, with a serene countenance he said, "Such a death is more worthy of our envy than our tears; this soul is condemned to Purgatory, but only for twenty-four hours. Let us endeavour to shorten this time by the fervour of our prayers." Enough has been said on the duration of the pains. We see that they may be prolonged to an appalling degree; even the shortest, if we consider their severity, are long. Let us endeavour to shorten them for others and to mitigate them for ourselves, or better still to prevent them altogether. Taken from: Purgatory Explained by: Father F.X. Schouppe, S.J. Ana de Monteagudo y Ponce de Leon was born in the Peru in the city of Arequipa in 1602. At the age of fourteen Ana was withdrawn from school for a marriage arranged by her father but she resisted vehemently. Persecution by her father and family only served to intensify her decision to become a Dominican nun. St. Catherine of Siena appeared to her and showed her a white habit, saying: "Ana, my child, I have prepared this habit for you. Leave all to God. Nothing will be wanting to you." Ana's fears vanished and she fled to the monastery of St. Catherine by night. Next morning her irate father rushed to the monastery and heaped verbal abuse on his daughter, humiliating her in front of the nuns and telling her he would never pay the dowry needed for her profession. She was disinherited and abandoned by her father. Eventually, her brother who was a priest, provided the dowry. Once professed in the monastery, Ana's nobility, courage, modesty, prayerfulness, and humility won the heart of the community. She was elected successively novice-mistress, sacristan, and prioress. At a hint of the bishop, she undertook a reform of the community whose worldliness and laxity had begun to cause gossip in the city. However the rigor of her reform aroused lively resentment and even threats of resistance and bodily harm. Heaven blessed the courage of Ana with remarkable charisma. She became universally admired among the people for prophecy, bilocation, supernatural discernment, visions, and miracles. Peruvians and foreigners sought her prayers and counsel. King Phillip IV of Spain, a Dominican tertiary, appeared to Ana after his death in 1665 asking her intercession and revealed to her later that he entered heaven three days after his death thanks to her prayers. 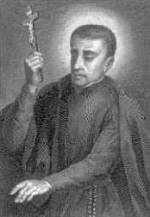 Ana's spiritual life was molded largely on that of St. Nicholas of Tolentino, Patron of Holy Souls. One day she beheld in a vision the Mother of God seated on a golden throne with St. Nicholas and a legion of angels beside her. St. Nicholas conducted her to Purgatory where she saw with horror a great throng of souls crowded together in the purifying flames. The saint said to her: "On earth I helped the Poor Souls; I now consign that noble office to you." 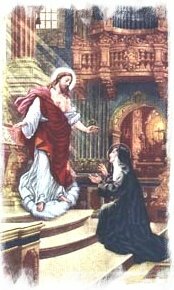 The compassionate nun offered to take upon herself the sufferings of the most abandoned souls in Purgatory and God accepted the offer. Although she was by this time 80 years of age, she accepted the unusual apostolate and suffered ten years of moral and physical torments. She was a beautiful model of the purest chastity and of the communion of saints. Ana's decade of atonement, during which she lost her sight completely, was sweetened by periods of divine consolation. Angels came to relieve her suffering and souls from Purgatory appeared at her bedside to thank her for her prayers. 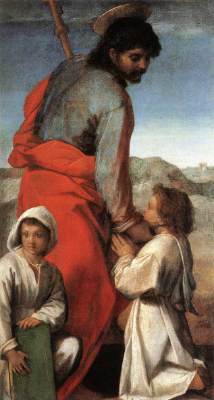 St. Bernard appeared with the Sacred Host for her communion and adoration. St. Nicholas showed her the thousands of souls which had entered heaven thanks to her charity. 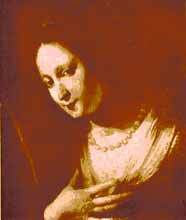 Ana died on January 10, 1686 at the age of ninety and when her body was later exhumed it was found incorrupt and fragrant. Many miracles of healing occurred during and after her burial. Pope Paul VI declared her venerable in 1975 and Pope John Paul II beatified her in February of 1985. Why must souls thus suffer before being admitted to see the face of God? What is the matter, what is the subject of these expiations? What has the fire of Purgatory to purify, to consume in them? It is, say the doctors, the stains left by their sins. The souls in Purgatory retain not the slightest stain of guilt; the venial guilt which they had at the moment of their death has disappeared in the order of pure charity, with which they are inflammed in the other life, but they still bear the debt of suffering which they had not discharged before death. This debt proceeds from all the faults committed duing their life, especially from mortal sins remitted as to the guilt, but which they have neglected to expiate by worthy fruits of exterior penance. Such is the common teaching of theologians, which Suarez sums up in his "Treatise on the Sacrament of Penance”. "We conclude then," he says, "that all venial sins with which a just man dies are remitted as to the guilt, at the moment when the soul is separated from the body, by virtue of an act of love of God, and the perfect contrition which it then excites over all its past faults. In fact, the soul at this moment knows its condition perfectly, and the sins of which it has been guilty before God; at the same time, it is mistress of its faculties, to be able to act. On the other hand, on the part of God, the most efficacious helps are given to her, that she may act according to the measure of sanctifying grace which she possesses. It follows, then, that in this perfect disposition, the soul acts without the least hesitation. It turns directly towards its God, and finds itself freed from all its venial sins by an act of sovereign loathing of sin. This universal and efficacious act suffices for the remission of their guilt. These debts of pain are the remains of sin, and a kind of stain, which intercepts the vision of God, and places an obstacle to the union of the soul with its last end. Since the souls in Purgatory are freed from the guilt of sin, writes St. Catherine of Genoa, there is no other barrier between them and their union with God save the remains of sin, from which they must be purified. This hindrance which they feel within them causes them to suffer the torments of the damned, of which I have spoken elsewhere, and retards the moment when the instinct by which they are drawn towards God as to their Sovereign Beatitude will attain its full perfection. They see clearly how serious before God is even the slightest obstacle raised by the remains of sin, and that it is by necessity of justice that He delays the full gratification of their desire of everlasting bliss. This sight enkindles within them a burning flame, like that of Hell, yet without the guilt of sin. 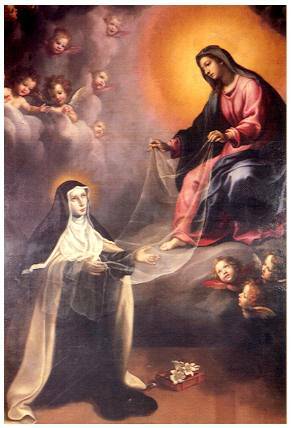 The following is an account of that of St. Magdalen de Pazzi, a Florentine Carmelite, as it is related in her Life by Father Cepare. Some time before her death in 1607, the servant of God, Magdalen de Pazzi, being one evening with several other Religious in the garden of the convent, was ravished in ecstasy, and saw Purgatory open before her. At the same time, a voice invited her to visit all the prisons of Divine Justice, and to see how truly worthy of compassion are the souls detained there. At this moment she was heard to say, "Yes, I will go." She consented to undertake this painful journey. In fact, she walked for two hours round the garden, which was very large, pausing from time to time. Each time she interrupted her walk, she contemplated attentively the sufferings which were shown to her. She was then seen to wring her hands in compassion, her face became pale, her body bent under the weight of suffering, in presence of the terrible spectacle with which she was confronted. She began to cry aloud in lamentation, "Mercy, my God, mercy! Descend, O Precious Blood, and deliver these souls from their prison. Poor Souls! you suffer so cruelly, and yet you are content and cheerful. The dungeons of the martyrs in comparison with these were gardens of delight. Nevertheless there are others still deeper. How happy should I esteem myself were I not obliged to go down into them." She did descend, however, for she was forced to continue her way. But when she had taken a few steps, she stopped terror-stricken, and, sighing deeply, she cried, "What! Religious also in this dismal abode! Good God! how they are tormented! Ah, Lord!" She does not explain the nature of their sufferings; but the horror which she manifested in contemplating them caused her to sigh at each step. She passed then into less gloomy places. They were the dungeons of simple souls, and of children in whom ignorance and lack of reason extenuated many faults. Their torments appeared to her much more endurable than those of the others. Nothing but ice and fire were there. She noticed that these souls had their guardian angels with them, who fortified them greatly by their presence; but she saw also demons whose dreadful forms increased their sufferings. Advancing a few paces, she saw souls still more unfortunate, and she was heard to cry out, "Oh! how horrible is this place; it is full of hideous demons and incredible torments! Who, O my God, are the victims of these cruel tortures? Alas! they are being pierced by sharp swords, they are being cut into pieces." She was answered that they were the souls whose conduct had been tainted with hypocrisy. Advancing a little, she saw a great multitude of souls which were bruised, as it were, and crushed under a press; and she understood that they were those souls which had been addicted to impatience and disobedience during life. While contemplating them, her looks, her sighs, her whole attitude was compassion and terror. A moment later her agitation increased, and she uttered a dreadful cry. It was the dungeon of lies which now lay open before her. After having attentively considered it, she cried aloud, "Liars are confined in a place in the vicinity of Hell, and their sufferings are exceedingly great. Molten lead is poured into their mouths; I see them burn, and at the same time tremble with cold." She then went to the prison of those souls which had sinned through weakness, and she was heard to exclaim, "Alas! I had thought to find you among those who have sinned through ignorance, but I am mistaken; you burn with an intenser fire." Farther on, she perceived souls which had been too much attached to the goods of this world, and had sinned by avarice. "What blindness," said she, "thus eagerly to seek a perishable fortune! Those whom formerly riches could not sufficiently satiate, are here gorged with torments. They are smelted like metal in the furnace." From thence she passed into the place where those souls were imprisoned which had formerly been stained with impurity. She saw them in so filthy and pestilential a dungeon that the sight produced nausea. She turned away quickly from that loathsome spectacle. Seeing the ambitious and the proud, she said, "Behold those who wished to shine before men; now they are condemned to live in this frightful obscurity." Then she was shown those souls which had been guilty of ingratitude towards God. They were prey to unutterable torments, and, as it were, drowned in a lake of molten lead, for having by their ingratitude dried up the source of piety. Finally, in a last dungeon, she was shown souls that had not been given to any particular vice, but which, through the lack of proper vigilance over themselves, had committed all kinds of trivial faults. She remarked that these souls had share in the chastisements of all vices, in a moderate degree, because those faults committed only from time to time rendered them less guilty than those committed through habit. After this last station the saint left the garden, begging God never again to make her witness of so heartrending a spectacle: she felt that she had not strength to endure it. Her ecstasy still continued, and, conversing with Jesus, she said to Him, "Tell me, Lord, what was your design in discovering to me those terrible prisons, of which I knew so little, and comprehended still less? Ah! I now see; you wished to give me the knowledge of your infinite sanctity, and to make me detest more and more the least stain of sin, which is so abominable in your eyes." Compiled by: Father F.X. Schouppe, S.J. St. Vincent Ferrer, the celebrated wonder-worker of the Order of St. Dominic, who preached with so much eloquence the great truth of the Judgment of God, had a sister who remained unmoved either by the words or example of her saintly brother. She was full of the spirit of the world, intoxicated with it's pleasures, and walked with rapid strides towards her eternal ruin. Meanwhile, the saint prayed for her conversion, and his prayer was finally answered. The unfortunate sinner fell mortally sick; and, at the moment of death, entering into herself, she made her confession with sincere repentance. Some days after her death, whilst her brother was celebrating the Holy Sacrifice, she appeared to him in the midst of flames and a prey to the most intolerable torments. "Alas! my dear brother," said she, "I am condemned to undergo these torments until the day of the last judgment. Nevertheless, you can assist me. The efficacy of the Holy Sacrifice is so great: offer for me about thirty Masses, and I may hope the happiest result." The saint hastened to accede to her request. He celebrated the thirty Masses, and on the thirtieth day his sister again appeared to him surrounded by angels and soaring to Heaven. Thanks to the virtue of the Divine Sacrifice, an expiation of several centuries was reduced to thirty days. This example shows us at once the duration of the pains which a soul may incur, and the powerful effect of the Holy Sacrifice of the Mass, when God is pleased to apply it to a soul. But this application, like all other suffrages, does not always take place, at least not in the same plenitude. Authored by: Father F.X. Schouppe, S.J. Let’s get their souls out as soon as possible. 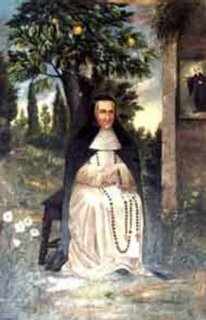 We read in the Life of Venerable Catherine Paluzzi that a holy Religious, who died in her arms, was not admitted to eternal beatitude until after she had passed an entire year in Purgatory. Catherine Paluzzi led a holy life in the diocese of Nepi, in Italy, where she founded a convent of Dominicans. There lived with her a Religious named Bernardine, who was far advanced in the ways of the spiritual life. These two saints emulated each other in fervour, and helped each other to progress more and more in the perfection to which God called them. The biographer of Venerable Catherine compares them to two live coals that communicate heat to each other; and again, to two harps tuned to harmonise together in one perpetual hymn of love to the greater glory of God. Bernardine died: a painful malady, which she bore with Christian patience, carried her to the grave. When about to expire, she told Catherine that she would not forget her before God, and, if God so permitted, she would return to converse with her on such spiritual matters as would contribute to her sanctification. prayer, saw a pit from which issued volumes of smoke and flames; then she perceived coming out of the pit a form surrounded by dark clouds. By degrees these vapors were dispersed, and the apparition became radiant with an extraordinary brilliancy. In this glorious personage Catherine recognised Bernardine and ran towards her. "Is that you, my dearest sister?" she said. "But whence do you come? What signifies this pit, this fiery smoke? Does your Purgatory end only today?" "You are right," replied the soul; "for a year I have been detained in that place of expiation, and today, for the first time, shall I enter Heaven. As regards yourself, persevere in your holy exercises: continue to be charitable and merciful, and you will obtain mercy." Great post on the holy Souls. very good I read them all, some very frightening, but there is hope, now I know I need to be more charitable and merciful. What an inspiration-must prayer harder for the souls in purgatory.